Free download Cricket Photo Fun + Photo Suit for Android with APK file. Download Cricket Photo Fun + Photo Suit new version from the direct link. Cheer your favorite country. Be the true cricket lover. See your photo in Cricketers photo suit and share the same with your friends and family members. Use the photo as your display photo on social media apps and website. It is simple and easy to use this app. Various Cricketer Photo Suit is provided in this application. Resize and adjust the suit to fix on your photo. Add photo effect to your cricketer photo suit. Add Photo frames to your cricketer photo suit. Write on photo anything you want. Install this cricket photo suit app for free from play store. You need to select your photo from gallery or need to click a photo using camera. You will be redirected to “Adjust your suit” screen, You can resize and tilt the suit to fix the suit perfectly on you. You can choose from various suits by sliding the suit at the bottom. 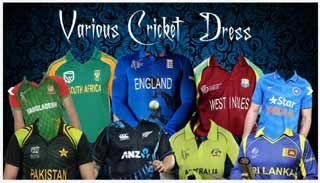 Cricket suit of following cities (India, Australia, Bangladesh, England, Pakistan, new zealand,etc). Click on save button (you can share this image or add more effct to your cricket photo suit). Photo Effect option is provided (negative, photo sketch , etc). Photo Effect (You can add frame to your photo). Text on Pic (You can write anything of your choice on your photo).